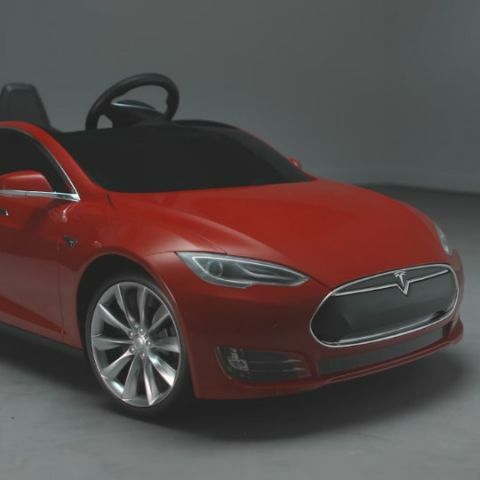 Tesla Motors has partnered with Radio Flyer to create a smaller version of the Tesla Model S for children. Called the Tesla Model S for Kids, small car is all-electric just like its bigger brother. It also comes with Flight Speed lithium-ion battery technology which Tesla claims to provide a longer range and faster recharging as compared to lead-acid batteries. For an added dose of realism, the battery can be charged by plugging in the car. Although, they can also be charged via an external unit. The battery is removeable, so parents can carry spare batteries. The prices for the Tesla Model S for Kids start at $500 (approx. Rs. 34,200) and will start shipping in May this year. In addition, the car comes with a number of nifty little features. The maximum speed of the vehicle is six miles per hour, however, this can be set to three miles per hour via a switch. The car comes with working headlights as well as a sound system that can be plugged into a music player. In addition, the car is available with same paint schemes as the Tesla Model S. Parents can also choose to purchase personalised licence plates, spare batteries, car covers, and more.